Register Log In ECN Forum Forums NEC & other Code issues Exothermic Welding or Irreversible Connections, Comments? 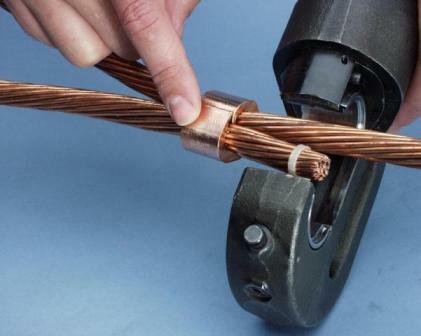 I am interested in hearing about your experiences concerning these two recognized code methods for splicing the GEC, etc..
We used to use the Caddweld system for all of our grounding grids in our substations but have gone to the mechanical type because of the above downsides. Is the mold that big metal block? 50 shots, how hot does the thing get, is the steel melting? Why aren't there replaceable inserts, are you supposed to buy a new one? The molds well that is a the costly part. Each mold is specific, in my cellar I have a 4/0 to 3/4" ground rod mold and a 4/0 run to a 2 AWG tap mold. You need a mold for each different wire size or application. The shop has a few dozen molds in stock, some have magnetic holders that hold the mold to building steel in order to cad weld a conductor to building steel. The process is fairly simple, clean the conductors, dry the mold (and conductors if damp) with a torch, clamp the mold onto the conductors, pour in the appropriate sized 'load', close the cover, with a glove on use a striker tool to light it off. Bright light, lots of smoke and presto you have a permanent connection if all went well. Remove mold carefully as the weld will be red hot and the mold is also smoking hot. I think the molds are made of graphite but I am not sure of that. Holy explative batman, those things are chemical? I guess that explains everything but the replaceable inserts. The mold is graphite and being very soft wears out from use. The openings get too larger to contain the molten copper. Sam, there is a very thin steel insert put into the bottom of the upper chamber and the reaction gets hot enough to completely melt the steel insert. The powder is copper oxide and aluminum, I believe. It is required to get a hot enough to actually make a weld. In my opinion, if done properly, the Cadweld makes a perfect connection and nothing is better. Because of the graphite mold getting a little oversized, I have used old pennies (the newer ones are copper plated zinc) to take the place of the steel insert. As I said before, this is not an approved method. I have used old pennies to take the place of the steel insert. U.S. Treasury may object too. I think technically they own the penny, you just own the value it represents. I guess the T men are after me too. I use pennies for shot pin washers. The crimp works Great just the tool is very expensive. There are now premade cadeweld charges made no pennies required that are set off electricaly no flame required.